See what I’ve been up to? They look pretty awesome, right? I made quite a few. I mean, a LOT. As in, I had to throw them all in a great big gallon size Ziploc bag to store them. So, you know what I’m gonna do? 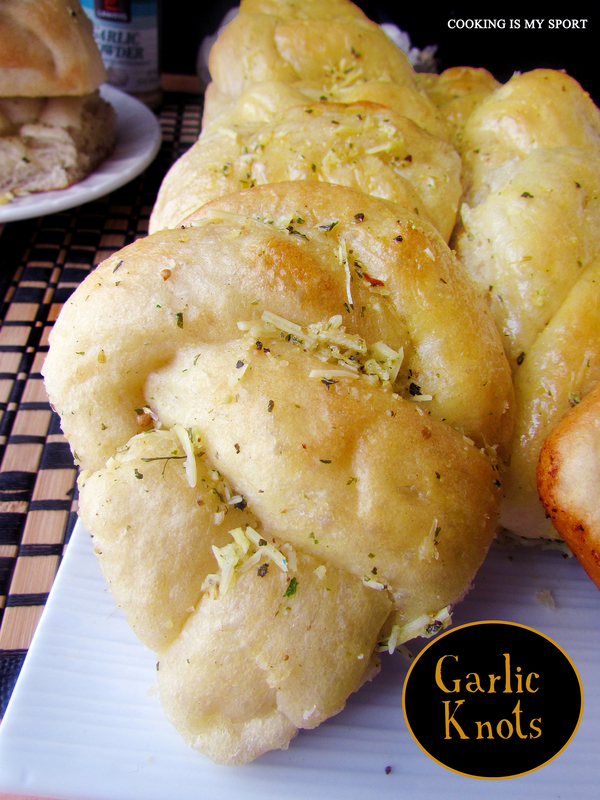 I’m gonna give you guys a crap load of excuses (I mean, REASONS) to eat just as many of these Garlic Knots as you want. Because in actuality, garlic is actually pretty good for you. And these have garlic in them. So it all floooooows together. Incidentally, they are also the “reasons” I gave myself that having just this many carbs in my house is a good idea. Garlic can combat common sicknesses, including the common cold. Apparently, by 63%. So when you start to feel those summer sniffles or itching coming on, what do you think you should do? Have some hot chicken noodle soup. And a Garlic Knot. Of course. Garlic may improve bone health, minimizing bone loss in females by increasing estrogen in females. Now don’t get me wrong: you should DEFINITELY keep taking those calcium supplements. Drink your milk. All that good stuff. But you know what else you should do? That’s right. You gotta get your vitamins in, guys. Don’t neglect your health. 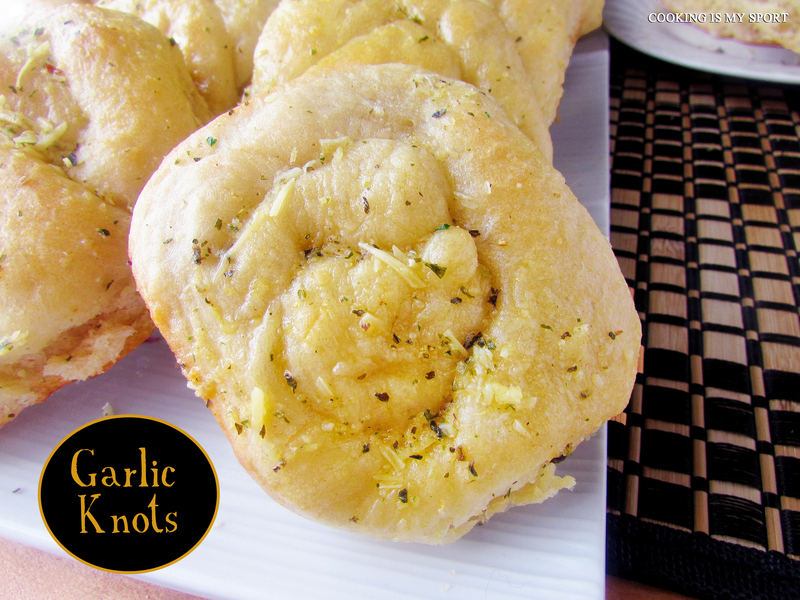 Eat a Garlic Knot. They’ll make you feel better. Trust me: I know. They’re light, fluffy and oh so delicious. They’ll also be at this week’s Fiesta Friday #78, co-hosted by Judi @ cookingwithauntjuju and Petra @ Food Eat Love. Combine the water, maple syrup and yeast. Let it sit for 10 minutes. Stir in the oil then, stir in flour and salt. Add additional flour 1 tablespoon at a time until the dough comes together, if needed. Place dough in a large, greased bowl. Turn to coat dough. Cover the bowl with greased plastic wrap, and let it rise until double in size, about 1 hour. Divide dough into 16 equal pieces. Roll each piece into a dough rope/snake that is about 9-10 inches long and about 1/2-inch thick. Shape into a knot (fold one end of dough over the other so that it looks like an awareness ribbon. Twist dough at the place where the two sides overlap. Fold ends back, and tuck under). 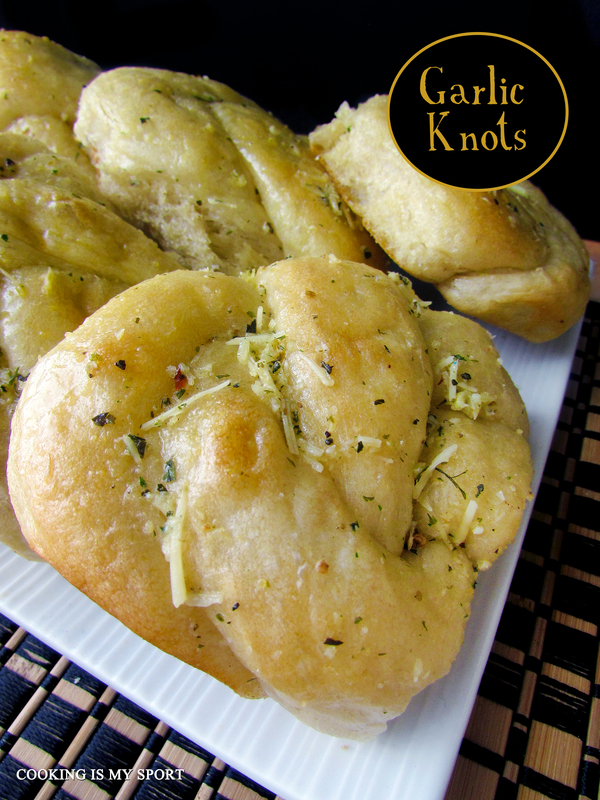 You can also just tie the dough into a knot and leave the ends out. 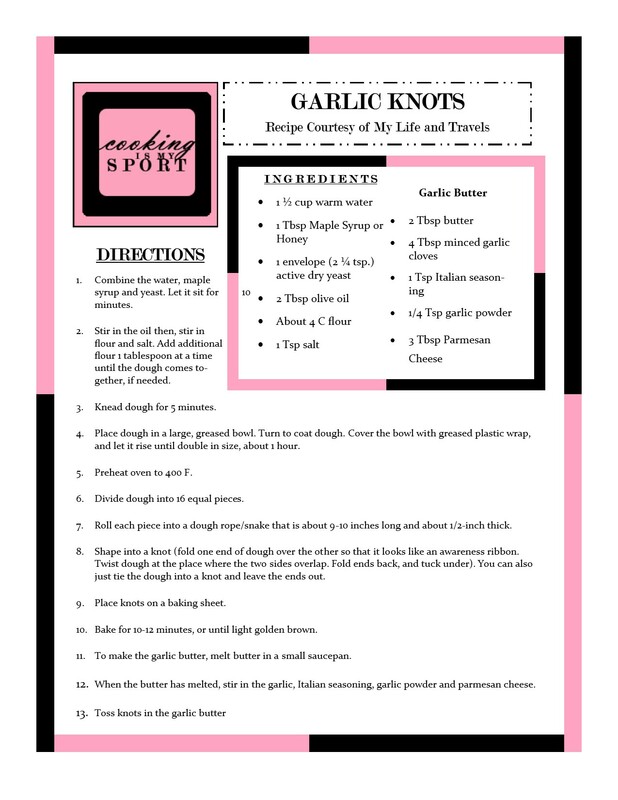 Place knots on a baking sheet. Bake for 10-12 minutes, or until light golden brown. To make the garlic butter, melt butter in a small saucepan. When the butter has melted, stir in the garlic, Italian seasoning, garlic powder and parmesan cheese. I am going to make these to go with my soup and I am not even sick. Sup! 😉 Why are you always making dangerous food that I’m obsessed with!?!? These look SO good!! Thanks Arlene- I think they can go good with just about anything! Do it Matt! They’re good for what ails ya lol Thank you! It’s a winner! I am going to try this! Please do, I think you’ll love them. Thank you! Fabulous! I don’t think you need to provide any reasons to eat these!! I like garlic so much I grow my own every Fall. As a matter of fact they are drying right now! 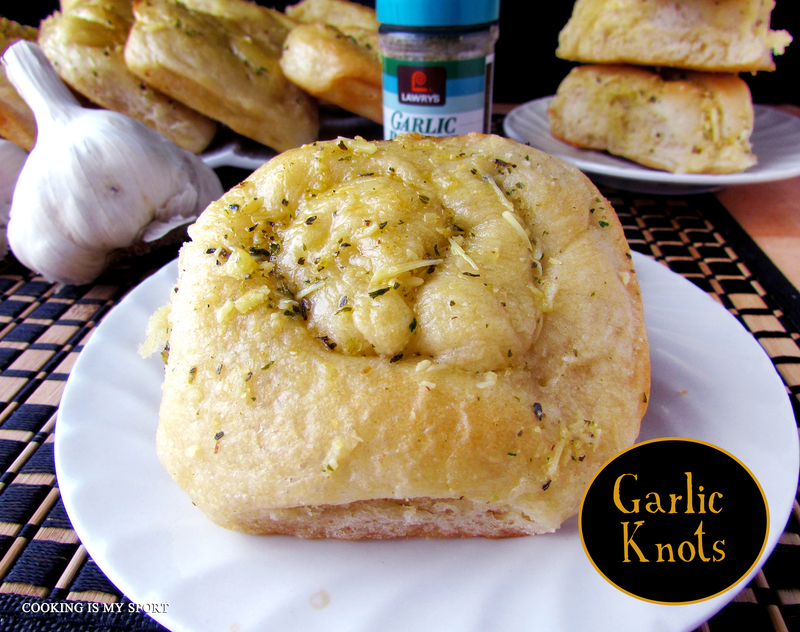 Perfect way to use garlic – who cares about the carbs. Thanks for bringing these to Fiesta Friday Jess! Since we get along so well, can you co-host this Friday, FF79? I know it’s short notice, but pleeeease….? 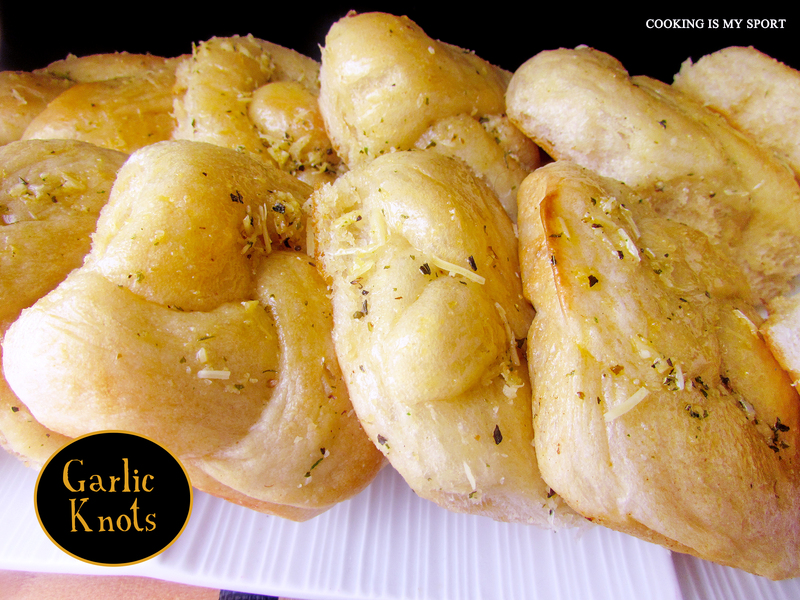 I looove Garlic and these garlic knots are calling my name 😀 YUM!! These look crazy amazing! 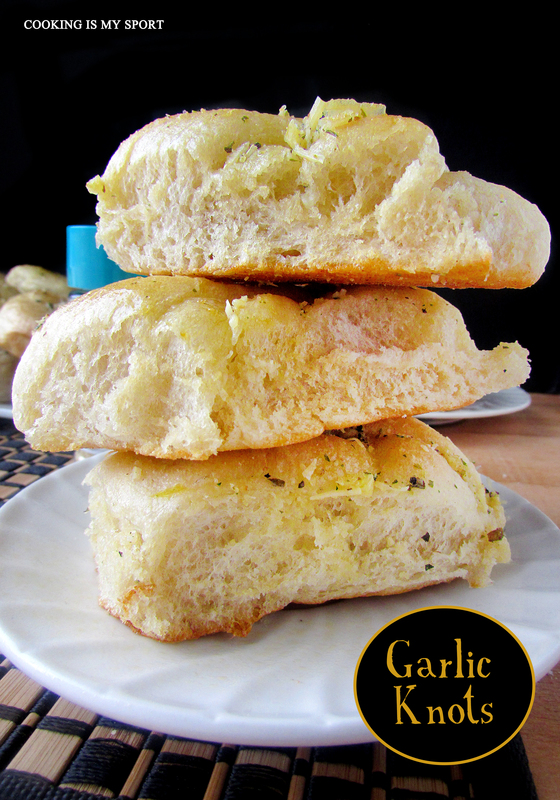 I am a sucker for bread and garlic. Pinning! Thank you Julie, I hope you can try them out sometimes, I think you’ll like them a LOT.